There have been many nail polish manufacturers who have released colors to raise awareness of various causes, such as OPI's Pink of Hearts 2 for breast cancer awareness, Jessica Cosmetics Empowered collection, also for breast cancer, Volunteer Cheer from Nicole which celebrates volunteerism, and so on. China Glaze offered the Ecollection focusing on going green to raise awareness to that cause. 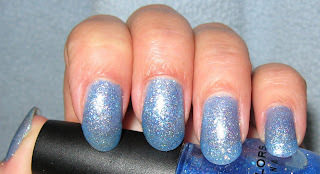 Makeupkaty, a member of Makeupalley.com, asked that we all wear blue polish today to raise awareness of colorectal cancer, which her precious Mom is battling. March is colorectal cancer month, and in recent years this type of cancer has been gaining awareness, thanks in part to Katy Couric's reporting of the disease after her she lost her husband to it. Early testing has increased among our population and great strides are being made to treat and cure it. I thank Katy for bringing awareness to colorectal cancer, as I lost my own Mom to this in September of 2003. So to Katy's Mom, continued success in your treatment and please know that many of us are hoping and praying right along with you. We are happy to hear from Katy that things are going well for you. So if you haven't already, paint your nails blue, say a prayer for Katy and her family for continued success and check out the beautiful blues that the ladies are exhibiting over on MUA. Above is my contribution to the cause, Sinful's Hottie. Thanks again Katy, for making us more aware of this cause.